Ladder Templates will allow you to configure how your ladders display in your database and on your website. 1. Click on the Setting icon and click on Settings. 2. Click on Ladder Templates. 3. On the right hand side click on the Add button to add a new template. 4. Fill out the details for the ladder including how many points for a win/loss/draw and once complete click Update Ladder Configuration. 5. 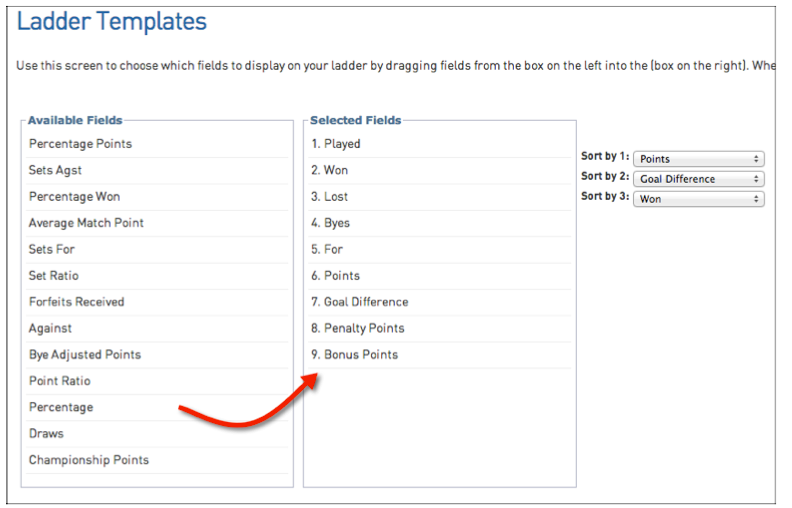 On the screen below, click and drag across the fields that you wish to display in your ladder into the Selected Fields box. 6. Set how you'd like the ladder to be sorted on the right hand side. 7. Click Update to complete the Ladder Template configuration.